Classically trained in French and Italian cuisine, this Westchester, New York native brings impressive credentials to the restaurant table. 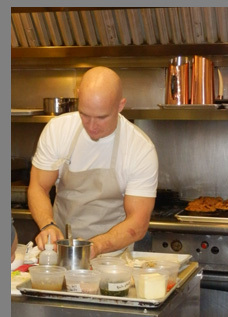 He graduated with honors from The Culinary Institute of America in Hyde Park, New York and received a Bachelor's degree in Business Management from Johnson & Wales in Providence, Rhode Island providing him with the necessary culinary skills and business acumen to succeed in back-of-the-house and front-of-the-house positions, both necessary as a chef restaurateur. Along the way, he had the good fortune to hone his craft working with Chef Jean Louis Palladin and Chef Marco Pierre White, and work at such acclaimed restaurants as Lutèce, Oceana, The Sign of The Dove, Rockenwagner, The Village Pub, Bix, The Barn and The Farmhouse at the Bedford Post where he worked with owner, Richard Gere, and at his first restaurant, elm in New Canaan, before moving on and opening his latest restaurant, The Cottage in Westport in December 2015. Speaking with Chef Brian Lewis in late January 2016 after having dinner at the restaurant, he summed up his vision for The Cottage by simply stating, "I have fun cooking," something that he clearly demonstrates in each of the recipes that he creates, where the names are as imaginative as his style. 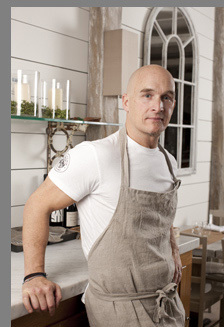 Having known him for several years and following his career, he continues to surprise us each time we experience his cooking with his playful, yet expertly crafted and presented recipes. Items described on the menu provide an idea of the ingredients without giving away the presentation. A good example of this is the description, Duck Fried Rice - maitake mushrooms - boy choy - sunny egg, which hints at ingredients but does not remotely begin to describe this impressive dish presented as thinly sliced duck on the plate alongside fried rice studded with duck confit, chopped maitake mushrooms and bok choy, and crowned with five sunny side up quail eggs. Chef Brian Lewis' culinary vision for The Cottage is the ability to cook for the community, a place where people can discover new food and new ingredients while extending wonderful hospitality to its guests and have it be a back to basics visceral experience for him. Food at The Cottage is based on seasonality and ingredients sourced from excellent purveyors, and he feels that one should have a foundation of the cultural heritage of food before embellishing it. He likes to stretch his range so that the customers will find the menu interesting without being overly experimental, with certain exotic elements. When not in the kitchen working on developing new recipes, Chef Brian Lewis enjoys spending time with his wife Dana and their twin sons Jude and Jax born in 2014. As if chasing toddler twin sons is not enough exercise, both he and his wife also heavily into CrossFit training. Chef Brian Lewis graciously shares a taste of The Cottage with his recipe for Maple Bacon & Eggs -robiola fonduta, and two of the restaurant's tasty signature cocktails. Method: Using an egg shell topper, carefully remove the tops of the eggs and empty the eggs into a mixing bowl. Place the empty eggshells in a bowl with warm water, rinse gently and then transfer to the reserved eggshell containers, upside down to allow them to drain. Let the eggshells dry for about an hour at room temperature. Using your fingers, gently remove any residue or "skin" left behind in the eggshell. Return to a clean eggshell container and store at room temperature until ready to use. Place the eggs, cream and crème fraîche in a stainless steel bowl. Bring a medium size pan of water to a boil and reduce the heat to low. Place the bowl of eggs over the heat and whisk constantly to create very small curds, for about 5 minutes. Be sure to leave the eggs a bit runny, as they will firm up while resting. Transfer the soft eggs to a disposable plastic pastry bag or thick plastic sandwich storage bag. Place in a warm place near the oven for up to 20 minutes. *Note: This egg preparation needs to be made within one hour of service. Equipment: One - iSi Whipped Cream Charger fitted with (2) c20 charges. Method: Place the cream and robiola cheese in a medium bottom saucepan and place over a very low flame. Season with salt to taste and melt slowly, stirring until cheese is fully melted. While still warm, transfer to a whipped cream dispenser and seal tightly. Add two CO2 chargers and outfit with a small tip. Hold in a water bath with a thermometer reading 54° C. st. (129° F). Assembly: With the egg shells sitting with the open end up in an eggshell container, carefully fill with the soft scrambled eggs two-thirds of the way to the top. Place the pointed tip of the robiola fonduta charger into the egg and gently disperse until the cheese rises to the top. Sprinkle with Maldon sea salt, minced chives and a generous drizzle of maple syrup. 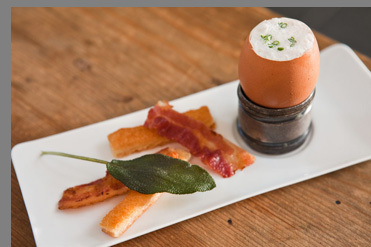 Place the bacon chip into the side of the egg allowing it to stand. Method: Shake and strain into champagne flute with sparking wine (bubbles) and top with remaining bubbles. Garnish with a long peel of lemon that is first rubbed on the rim of the glass and then inserted into the cocktail to impart lemon oils. Method: Rim glass with vanilla and cardamom sugar rim. Shake and strain into rocks glass. 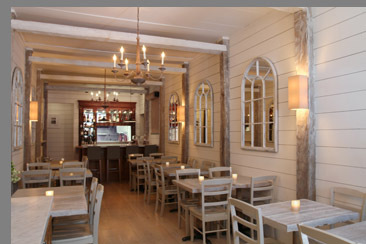 Read about our dining experience at The Cottage in the Restaurants section. The Cottage is open Tuesday through Thursday from 5:30pm until 9:30pm, Friday and Saturday from 5:30pm until 10:30pm, and for Sunday Brunch from 11:30 am until 2:30 pm, and for Supper on Sunday from 5:30 pm until 9:00 pm. Conveniently located one-third mile from the Westport Country Playhouse (25 Powers Court) The Cottage is also perfect for pre or post-performance dinners. Follow Luxury Experience on Facebook at www.Facebook.com/LuxuryExperience to see more photos. © February 2016. Luxury Experience. www.LuxuryExperience.com All rights reserved.